Description: UP 5747 and 6369 wait to haul a WPS coal drag north. Description: A set of UP units leads this 125 car AEPX coal train to Texas, about to cross Country Club Rd. Description: Headed towards Harrisonville and ultimately Kansas City was this APL Empty UP Train. There was an Unpatched SP on the rear end. Description: Rolling up the approach to the KCT Kaw River Bridge over Kansas Avenue. Description: Loaded UPRR Amarillo, TX to Beaumont, TX grain train GSARBE-15 rolls through Roanoke on the UPRR Choctaw Subdivision - UP AC4400CW 5747, UP AC4400CW 6783, 99 cars, and rear DPU locomotive UP AC4400CW 5993. This train originated on the BNSF at Amarillo and operated with a UPRR crew to Herington, KS before heading south to Beaumont. Description: Southbound UP gondola train. Description: Westbound coal empties on CIMNA9-6 cross the peaceful Meramec River on a summer-like May day. 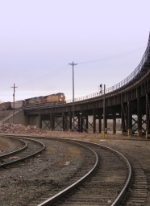 Description: A welded rail train on the end of the Altoona Sub. Description: WEPX loads eastbound on the Geneva sub.